I am almost out of my apartment. Everything I own has either been given away, thrown out, or in storage. Despite the ever-present fear of uncertainty, this feels like the right thing to do. I do encounter small bouts of panic from time to time, then it passes. Sometimes I feel I’m too old to do something like this…that’s another reason why it feels good. And hey! I am heading out of town to work after all! Let’s not forget that! On another note – I went to a reunion last week. Before I left for Los Angeles, I lived and worked in Washington, DC. 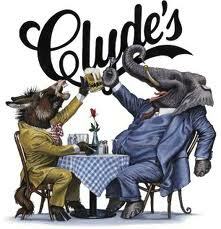 While there, I worked at a restaurant/bar called, Clyde’s. I was hired there as a busboy while I was still an undergrad at GWU. When I left, I was running the bar. Needless to say, some of my best times were there. Great friends were there, amazing memories. Last monday was their 50 year anniversary. I was asked back to guest-bartend; I gladly accepted. Was fun to be back…kinda like I never left. Reunions bring reflection; for me, at least. Provides a forced, honest look at my time since then. I acknowledge that I am hard on myself; I never am fully satisfied with where I am. Always wanting more. Comparing my progress to others’ (for better or worse).